Why Paddle solo when you can take out up to 8 mates on one of our mega Stand Up Paddleboards? 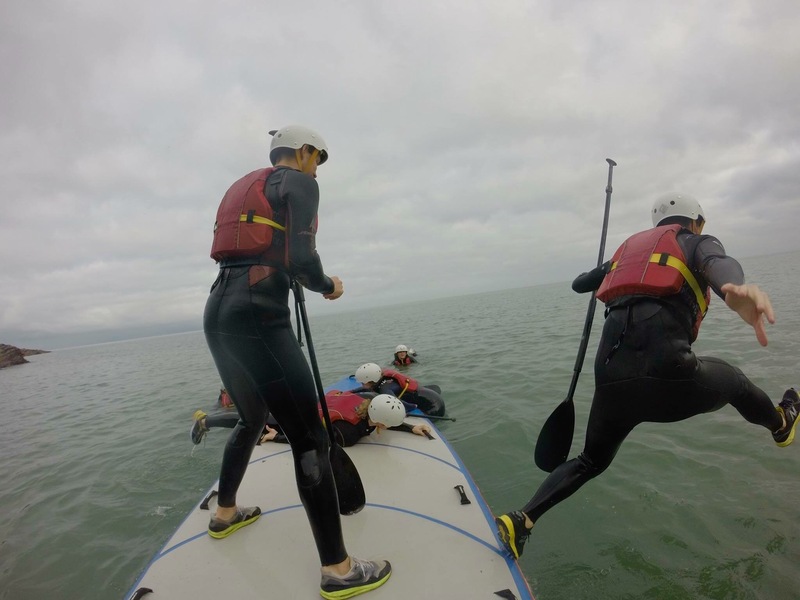 They’re great fun for groups and a brilliant way to explore the stunning North Devon coastline around Ilfracombe, near Woolacombe and Croyde, where you’ll paddle around a beautiful bay finding gullies, exploring caves and jumping off rocks and swimming in the sea. What makes it a real adventure? We take your group to one of the secluded coves on our private coastline. Our instructors will get you lighting your own fire without matches and cooking delicious treats over a beach campfire. Feeling competitive? We organise fun games and races for large groups too, using our full fleet of rafts and paddleboards. This session is an instructor favourite because we can cram so much good stuff into this session, we would reccomend it to anyone who loves the sea and doesn't mind a bit of falling in! Minimum age of 8 and four strong adult paddlers are required to book up one Giant SUP. Prices are £38 per person for a three-hour Party SUP session. Use the contact us page to discuss and book your party SUP session. Please be aware that due to the high demand for this activity we are unable to offer refunds if you choose to cancel.